It is hard to explain what virtual reality is without seeing it for yourself. In essence virtual reality is an environment a user enters into which is displayed to the user on a display. The display can vary from computer screens, mobile screens or even rooms that have virtual reality projected onto the surrounding walls. Virtual reality or virtual realities (VR), also known as immersive multimedia or computer-simulated reality, is a computer technology that replicates an environment, real or imagined, and simulates a user’s physical presence in that environment in a way that allows the user to interact with the virtual reality environment. Virtual realities artificially create sensory experience, which can include sight, touch, hearing, and smell. In some cases the user might have only limited interaction with the virtual reality environment, and in other cases the user can completely interact with the virtual reality environment. 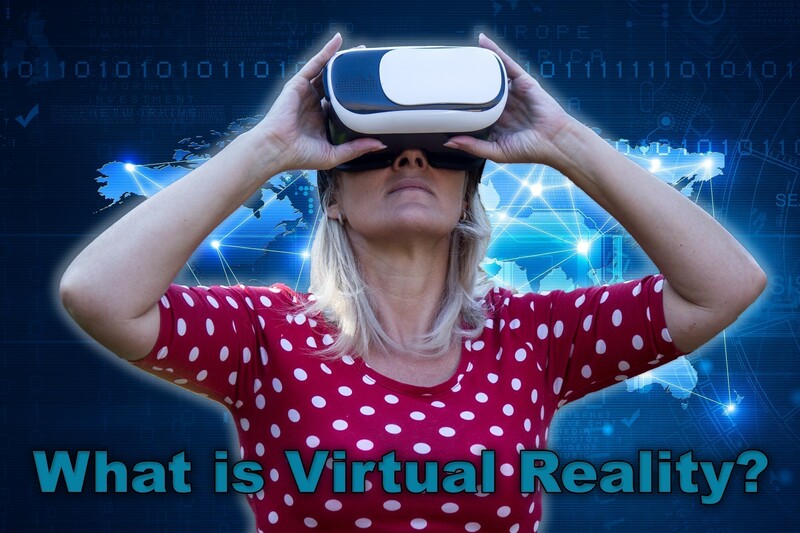 In the modern-day and future Virtual Reality environments users might experience virtual reality as reality, and minds might be tricked that it would be very hard to distinguish what is real, and what is virtual. The latest virtual realities are displayed on computer screens, smartphone screens, or in virtual reality headsets with fixed lenses. It is also possible to project virtual reality onto big screens or virtual reality domes. In these domes people are surrounded by Virtual Reality and it is not necessary to wear a virtual reality headset to fully experience the immersive effect of VR, with the virtual reality projection domes, you are physically surrounded by VR and it feels as if you are really there. The latest Virtual Reality environments, software and headsets include additional sensory information and focus on real sound through speakers or headphones targeted towards VR users. Some advanced haptic systems now include tactile information, generally known as force feedback in medical, gaming and military applications. These haptic systems allow people to now also feel inside virtual reality. The user might be in a game scene and where in the past there was no physical means to feel how a “Car” feels in Virtual Reality, the user can now touch the car, and it would feel similar to a real car that you are touching through this force feedback systems. Another example would be where you are in a virtual reality environment and there is a girl that you want to kiss, in the past you wouldn’t have felt a thing, but with haptic devices and force feedback becoming a reality it might soon feel as if you are really kissing someone. This also applies when playing a shooting game. Now virtual reality programmers can program the game in such a way, that if you are wearing a haptic suite and with force feedback, you might feel the bullets as they hit you in the virtual reality game. Furthermore, virtual reality covers remote communication environments which provide virtual presence of users with the concepts of telepresence and telexistence or a virtual artifact (VA) either through the use of standard input devices such as a keyboard and mouse, or through multimodal devices such as a wired glove or omni-directional treadmills. The immersive environment can be similar to the real world in order to create a lifelike experience—for example, in simulations for pilot or combat training—or it can differ significantly from reality, such as in VR games. The future of virtual reality looks very bright. For the first time in human history the technologies to reconstruct the real world in a virtual reality world is here. Technology is also not standing still and across the globe manufacturers, inventors, designers and programmers are working to make virtual reality better and better. On a computer we can create imaginary worlds and imaginary environments quicker and easier and less expensive than in the real world. In the real world we are also hampered by the things we can do, where in virtual reality the limits we have will decrease year by year, as better technologies becomes available. In the real world we have something called gravity, in the virtual world we can have gravity, less gravity or no gravity at all. This might sound useless but ask any kid if he would like to fly and the answer would likely be a loud yes. In Virtual Reality because we are not limited by gravity we could actually fly if we wanted to. This could also feel so real, that our brains are tricked into believing that we can actually fly. Another real world scenario would be “cars” how many of us, can just go to a Ferrari, Lamborghini or Porsche dealership, pick a car and drive out of the dealership without paying for the car. In the real world it is really hard for the average person to afford any of the “Super Cars” in the real world. A person will have to work hard, earn a above average income and have a lot of luck on his side, to be able to just walk into any auto dealership pick a car and drive out of the dealership. In virtual reality this would all be possible, in the near future. In VR it would cost you much less to get a virtual Ferrari or a virtual Lamborghini than it would in the real world. But in VR it could be affordable to anyone. You may at the moment believe that nothing would make the virtual reality world as good as the real world, but in the future Virtual Reality may prove you wrong. What if the technology is so good, that you simply cannot distinguish between real and virtual reality once you enter the future of virtual reality. Even now with the current limits VR have, for some people the virtual reality world could be better than the world they currently live in. Lets look at people with disabilities for instance, someone might be confined to a bed, or be disabled and cannot freely move. In the virtual reality world, these limits do not have to exist and people with disabilities could move freely, and visit places where they could not go before. in the future, even now it is possible for students in 1st world countries and 3rd world countries to experience education in a way that they would not be able to afford. Virtual Reality bridges limits we have in the real world. Students could use Virtual Reality to travel back into the past, and experience things like if they were there. Imagine the first moon landing was recorded in VR or a VR environment was to be created similar to the moon landing. Students can interact with the environment and explore it on their own terms. Doctors can watch operations in VR, and in a Virtual Reality environment see exactly how a heart transplant is done, or a leg amputation and prosthetic leg fitted. He might have the knowledge of how to do it but never had the opportunity to sit in on such an operation. Now the student or the doctor can sit in and see exactly how it is done, and seconds later Teleport back to the real world and do something totally different. Many of the technology industry giants like Google, Facebook, Microsoft, Apple, Samsung, HTC and Facebook to name a few is heavily investing in virtual reality, Never before have I seen an industry getting so much backing and attention as the Virtual Reality industry. These companies are all investing serious money, resources and know-how into the development. In summary to what is virtual reality, virtual reality entails presenting our senses with a computer generated virtual environment that could be real or fictional or both and in which we can explore, immerse and interact with in some way. As humans we have longed search for a way to travel back into time, we all have past moments in our life which we would love to revisit. Time travel have always been intriguing to me, and I have always watched movies like Back to the Future, Terminator, Primer, Looper, About Time and Star Trek movies and thought how awesome would it be to go back into time. 360° video will soon become the way to “Travel back into time” in the future 360° video’s shot now will become the time machine. In 20 years from now we would be able to watch a 360° video and it would feel as if we are back in 2016. In this 7 minutes video Marques Brownlee explains what is virtual reality. If you haven’t heard about Virtual Reality yet, or not sure what all the fuss is about check out the video.